Geoff quoted Vox on Donald Trump's interruptions during last night's debate, and discussed the extraordinary childishness of some of those interruptions. I don't have much time this morning, so I'll just add a few words about words. I have time for only a few simple remarks about content. For those who care about first-person singular pronouns (I me my mine), they constituted 4.03% of Trump's words and 2.72% of Clinton's. 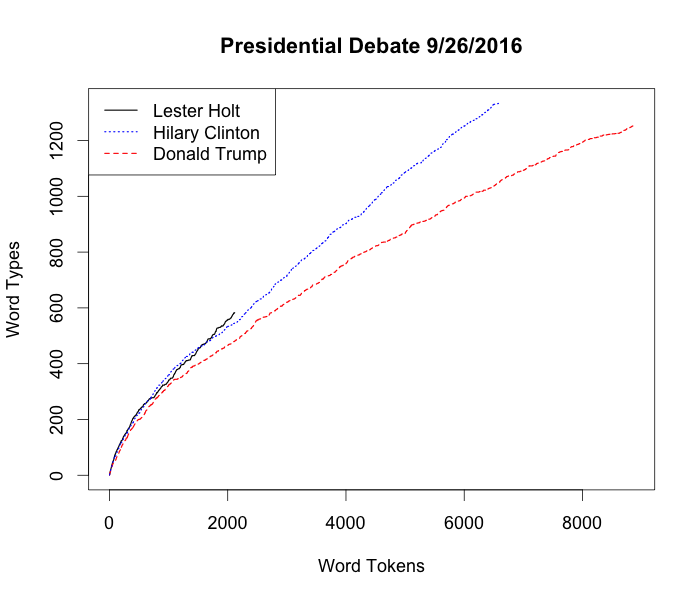 For those who care about first-person plural pronouns (we our us ours), they constituted 2.63 percent of Trump's words and 3.60% of Clinton's. Trump's ratio of "I" to "we" was 296/158 = 1.87; Clinton's ratio of "I" to "we" was 161/172 = 0.94. I'll be interested to see whether we'll hear anything about this from the pundits who made such a consistently big deal about Barack Obama's allegedly excessive (and actually quite low) rate of first-person singular pronoun usage — I'm guessing not. I guess those who live by reality TV will, well, live by reality TV. HOLT: Why is your judgment — why is your judgment any different than Mrs. Clinton's judgment? I feel like he's operating at an entirely different frequency, living in a radically different Weltanschauung (or, like Leary/Wilson used to call it, a different "reality tunnel"). At the very least, he certainly has completely different expectations than mine about what's a "debate", possibly even a "conversation". He seems to use words more or less like peacocks use feathers, or frilled-neck lizards use frills. I'm most intrigued by Trump's support, by what function does he fulfill. At least part of his support seems to be because he breaks linguistic taboos. For people who resent what they call "political correctness"—who see it as a loss of liberty, a thought-police, and unconsciously as a disagreeable forced admission of guilt—it must be exhilarating to rally behind a living stream of rambling narcissism. In the same way, perhaps the incoherence itself works as a "collective middle finger" to the intellectual class, or to the notion of discourse itself, not just the "political establishment". And I can't really blame the supporters. The intellectual class failed them, as did the political class and global capitalism (I'm intrigued and baffled by the way that Trump conflates xenophobia with resisting free-market globalization). Things are bad (1, 2). What you say – leoboiko – about Trump's support base is so true, the liberal intellectual class failed them and it's hard to blame people for feeling disenfranchised. It reminded me that Chris Hedges predicted the rise of Donald Trump at the end of the last election in 2012. "The presidential election exposed the liberal class as a corpse. It fights for nothing. It stands for nothing. It is a useless appendage to the corporate state. … Any mass movement that arises—and I believe one is coming—will be fueled, like the Occupy movement, by radicals who have as deep a revulsion for Democrats as they do for Republicans. The radicals who triumph, however, may not be progressive. Populist movements, from labor unions to an independent press to socialist third parties, have been destroyed in the United States. A protofascist movement that coalesces around a mystical nationalism, that fuses the symbols of the country with those of Christianity, that denigrates reason and elevates mass emotions will have broad appeal. It will offer to followers a leap from the deep pit of despair and frustration to the heights of utopia. It will speak in the language of violence and demonize the vulnerable, from undocumented workers to homosexuals to people of color to liberals to the poor. And this force, financed by the most retrograde elements of corporate capitalism, could usher in a species of corporate fascism in a period of economic or environmental instability."